This is a fun rendition of Tandoori. It is adapted from a recipe in Cuisine At Home seven years ago. Since most people don't have a tandoor; a wood clay oven, similar results can be obtained by grilling the turkey on high heat. Don't be put off by the amount of spices used. Combined with the yogurt and sour cream for the marinade the spices are what make this dish. Chicken breasts can be substituted for the turkey. 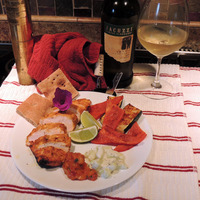 I served the Tandoori with peach ginger chutney and cucumber mint raita to cut some of the heat. Links to both recipes are provided. As a side vegetable I served grilled squash and red pepper. I also served freshly baked Afgan Naan bread. Combine yogurt, sour cream, lime juice, sugar, spices, garlic, ginger, salt, and chili powder. Combine completely then add turkey tenderloin and marinade in a plastic bag. Refrigerator for at least 1 hour or up to 24 hours. Preheat grill to high heat, when hot oil the grill to prevent sticking. Grill the turkey covered for 8-10 minutes, or until it releases easily from the grate. Turn pieces over and grill about 5 more minutes or until firm to the touch and cooked through. Remove turkey from grill and let rest 2-3 minutes, then brush with melted Ghee. Slice diagonally and serve with chutney, raita, naan bread and grilled vegetables. Sounds amazing! love the rich flavors here! Amazing combination of spices. I wonder if I could make the sauce for tofu cutlets? ?